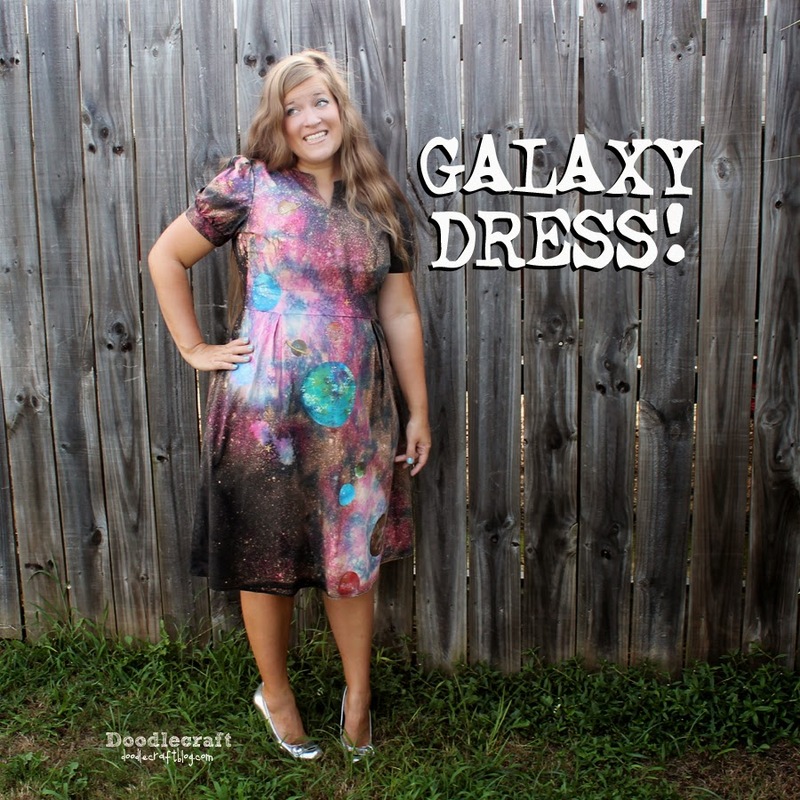 Doodlecraft: Glitter Painted Galaxy Shirts! Did you know that today is Meteor Watch Day? Yep, every year on June 30th! I know, there are so many crazy holidays! Well, to celebrate...let's make a galaxy! First spray bleach on garment. I lay mine out on the back patio. Let the bleach work...most shirts turn orange. Some I've done have turned white! This is the perfect solution to the shirt that was "accidentally" bleached! Then put them through a wash cycle with soap. Remove the shirt from the wash...and while it's wet, lay it back outside. You could put a garbage bag under it to protect the cement...but it comes off eventually! Then swirl and splash color all over the bleached parts! Wrap in a plastic bag for 8 hours or overnight. Next day, wash out the shirt in the sink until the water runs clear. Then throw it in the washing machine with soap...and dry it. It comes out so awesome! Full of nebulas, galactic spiral arms...everything! You can leave it tie dyed and awesome...or you can paint on planets! I used acrylic craft paint and Tulip Fabric Spray Paint Glitter! I used my silhouette cameo to cut clear vinyl circles we used as stencils. And stick them right on the shirt. Then use a stencil brush or sponge and just sponge on color! Then spray the fabric glitter all over the planets, the nebulas...the stars! Add some rings to a few planets! It gives it a subtle sparkle! I am absolutely hooked on these galaxy shirts! "Yes the Universe does revolve around me!" These shirts are "Outta this World!" If you haven't tried this yet...what are you waiting for? Here's more "Out of this World" Awesomeness!